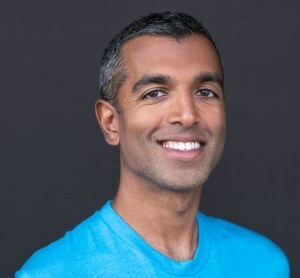 “Eat your greens” is very reasonable advice for improving health, but it is also vague, especially for people following a reductionist approach to their food. We know that carotenoids are beneficial and are found in yellow-red foods, anthocyanins are found in the red-blue spectrum, and copious other polyphenolics are found in fruits and veggies. Greens, however? What could explain the benefits found in these veggies? It turns out that the leafy greens, even humble lettuce, are great sources of the small nitrogen-containing molecule nitrate. Nitrate (NO3-) forms the starting step for one of the major ways the body can get nitric oxide, a small yet potent signalling molecule that relaxes blood vessels and improves blood flow. 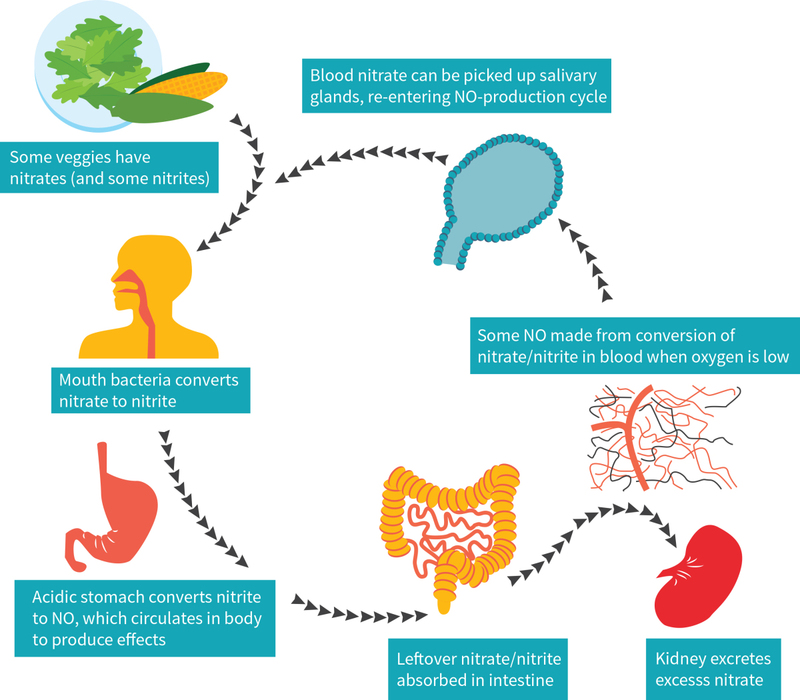 Strangely, the route for nitric oxide production from veggie consumption involves saliva, as seen in Figure 1. After nitrate is ingested, the intestines digest the compound and then it’s secreted into saliva, where various mouth bacteria digest the nitrate (NO3-) into nitrite (NO2-) for eventual reabsorption in the digestive tract on an as-needed basis. Nitrite is then converted into nitric oxide throughout the body’s tissues by a wide variety of compounds. This pathway from nitrate, to nitrite, and finally to nitric oxide can be a major player in reducing blood pressure. This process doesn’t require the nitric oxide synthesizing enzyme found in blood vessels, which is known as endothelial nitric oxide synthase (eNOS). While eNOS also plays a major role in reducing blood pressure, its role in regard to health is preventative, and it works best when maintained, rather than being forced to work harder. eNOS regulation is generally not modulated by supplements. While problems with eNOS would likely increase blood pressure, providing a dietary supplement of the amino acid that eNOS uses (L-arginine) would be a very unreliable way to improve circulation. Due to its potency, reliability, and safety, nitrate from beetroot juice was tested in this clinical trial. It had already been investigated as a single dose treatment in previous trials. This is the first trial to examine a sustained usage of this supplement and its effects on hypertensive subjects of all ages, regardless of medication. It’s not only uncouth, but could spitting be unhealthy too? While it might not have many other health effects, spitting does actually impact nitrite production. Researchers have determined that, due to the convoluted metabolic pathway involving digestion and saliva, if you spit heavily after taking nitrate supplements, you will fail to reap the benefits of nitrite and thus nitric oxide. Go easy on that mouthwash as well, we don’t want to kill our bacterial friends. They work so hard to produce our nitrite! Nitric oxide (NO) relaxes blood vessels and can reduce blood pressure. It is synthesized in a couple of ways in the body. One of those ways uses nitrate (NO3-) from food sources. The authors investigated nitrate supplementation in participants of all ages (18-85) who, beyond having hypertension as assessed by an ambulatory blood pressure (measurement throughout the course of a normal day, rather than in-office measurement) exceeding 130/85, were healthy and had no manifestation of cardiovascular disease or abnormalities in kidney function. Blood pressure medication use was not a reason to exclude participants from the study, so people were accepted regardless of whether they were on medication. After screening, the study enrolled 34 patients on blood pressure medication (which was held constant throughout the study) and 34 patients not taking any blood pressure medication. Four of these subjects later dropped out, but drop-out was spread evenly and did not greatly influence the findings. The participants were randomly assigned either 250mL beetroot juice containing 6.4mM of nitrates, or placebo beetroot juice, which lacked an appreciable amount of nitrates. Supplementation took place over four weeks. Beyond the difference in nitrate content, the two juices were identical. 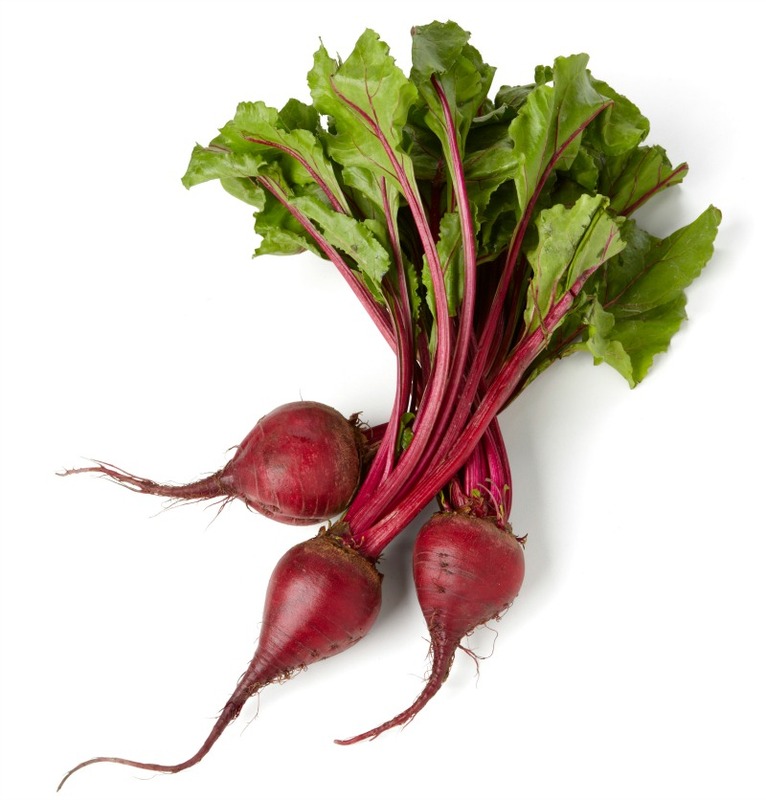 Beets are one of the most common, if not most commonly targeted dietary source of nitrates. 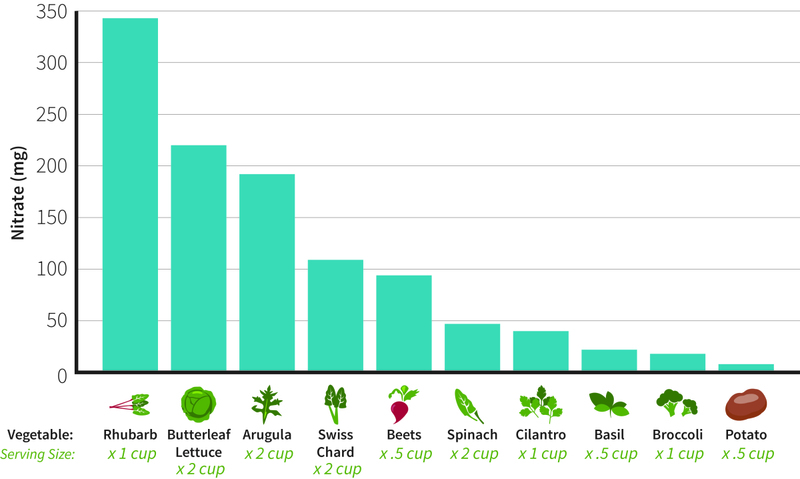 Figure 2 shows nitrate values in different commonly eaten veggies (which can vary widely depending on where the plant is grown). Beets have a much higher sugar content than most vegetables, which along with having a greater density (as opposed to leafy vegetables, which would require many handfuls in order to equal the same weight as a few beets) may contribute to their popularity as a nitrate source. Note that the study used beetroot, not beet greens. The final group composition showed a balance in age, with an average age of about 60 years (56 and 58 years of age in the placebo and nitrate groups, respectively), as well as a non-statistically different number of females per group (22 and 16, respectively). The participants were mildly overweight on average, with a mean BMI of 26.5 and 26.8 in the placebo and nitrate groups. The major endpoint of the study was change in blood pressure, which was measured in two ways. Each day, starting two weeks prior to the study and for the duration of the study, patients took their own blood pressure readings with an oscillometric blood pressure device (an arm cuff, similar to the commercial kind found at drug stores). On two occasions, the day before the study started and the final day of the study, the patients were subject to a 24-hour ambulatory blood pressure test. These ambulatory tests run for the course of one entire day and are usually used to draw more accurate conclusions, since blood pressure readings are fickle and can drastically change from one acute test to the other, as is seen with ‘white coat hypertension’. Other measurements taken in these two visits included collection of fluids to assess pharmacokinetics of nitrates (urine, saliva, and blood measurements that give insight into what happens to the nitrates within the body) and other vascular function tests to supplement the blood pressure readings. The vascular tests used were pulse wave velocity (PWV), which is the gold standard measurement of arterial stiffness and a reliable predictor of overall mortality from cardiovascular diseases, augmentation index (Alx) which is also an indicator of arterial stiffness in the aorta, and flow mediated dilation (FMD) which is a measurement of how well an artery can relax and dilate in response to stressors (a physiological process that helps prevent increases in blood pressure when blood is being pushed through in greater quantities than normal, which would increase blood pressure if the vessel doesn’t widen in response). After the second round of measurements were taken by the researchers at the clinic, additional blood readings were done two weeks after supplementation ceased, which concluded the study. ‘White coat hypertension’ was first noted by doctors who, donning their white coats, saw that non-hypertensive patients sometimes still displayed high blood pressure when measurements taken in the doctor’s office. This is thought to be due to the anxiety that some people experience during a doctor’s visit. Clinically, it necessitates multiple readings from a patient on different days in order to attain a diagnosis of hypertension. Studies often use 24-hour ambulatory blood pressure readings or supplement the data with self-measured blood pressure to avoid the issue. Self-measured blood pressure has been shown to be valid for use in clinical trials, and you can even automatically keep track of measurements using smartphone. Hypertensive patients, both those who were taking blood pressure medications and those who weren’t, took beet juice either containing nitrates or with the nitrates removed for four weeks. Blood pressure and other vascular measurements were taken to determine how dietary nitrates affected these measurements. The nitrates ingested through the juice appeared to be successfully absorbed by the body. When looking at the two groups given nitrates (with or without medication) in comparison to the two groups given placebo, there was a large increase in NOX (shorthand for nitrate plus nitrite) by 0.52µmol/L, or 2.7-fold the concentration these subjects had at the beginning of the trial. cGMP, the signalling molecule produced after nitric oxide, also increased 1.4-fold, supporting the idea that nitric oxide itself was stimulated after supplementation. Nitric oxide itself cannot be measured in a living human since it is a rapidly synthesized and rapidly destroyed molecule, with an elimination half-life measured in milliseconds. There were no changes in transcutaneous arterial methaemoglobin (a biomarker of oxygen delivery), heart rate, or any other glycaemic, biochemical, or haematological biomarker in either group. It appears that out of these measures, the only clinically relevant change was the desired increase in total NOX and cGMP. The changes observed did not differ in subjects who were or weren’t on medication, as everybody experienced an increase in these desired biomarkers. The increase in NOX and cGMP was notably measured in a fasted state in the lab, not immediately after nitrate ingestion. When supplementation ceased for two weeks, these readings reverted to normal. This provides evidence that a daily dose of nitrates is enough to support your body for at least 24 hours, though these benefits will be lost in two weeks if supplementation is not maintained. When looking at the daily blood pressure readings taken by the subjects themselves, nitrate consumption appeared to cause a significant reduction of systolic blood pressure after a single week. Nitrates continued to have a time-dependent benefit all the way up to the last week of supplementation, reaching their peak efficacy of an 8.1mmHg/3.8mmHg reduction in systolic/diastolic blood pressure. Again, these changes were not accompanied by any changes in heart rate. There was some variance between subjects, as this final reading had a wide 95% confidence interval of 3.8-12.4mmHg systolic and 0.7-6.8mmHg diastolic, but every subject who took nitrates saw some degree of reduction in blood pressure. The other blood pressure measurement, ambulatory blood pressure (ABP), displayed similar benefits. When compared to their baseline levels, the subjects who took nitrates daily experienced an average reduction of 7.7mmHg systolic and 2.4mmHg diastolic. There were not any major fluctuations throughout the day in the ABP. Nitrates induced a sustained reduction of blood pressure over both sleeping and waking hours of similar magnitude. The secondary measurements taken in this study were related more to blood flow rather than pressure, which is a useful biomarker in and of itself, as increases in blood flow are cardioprotective even if blood pressure does not change. Pulse wave velocity (PWV) was reduced by 0.59m/s in the subjects taking nitrates when compared to their baseline values and to a similar magnitude (0.58m/s) when compared to placebo, as this parameter was not changed with the nitrate-depleted placebo. PWV reductions of this magnitude have been associated with sizeable decreases in heart disease risk. AIx and FMD both saw significant benefits as well. These measurements were reduced by 5.2% and increased by 1%, respectively, while the placebo group experienced no changes. These findings support the use of nitrate not only as a blood pressure-reducing agent, but also as a supplement that could benefit overall circulatory health. Based on the significant improvement in the measurements of arterial stiffness and the reliability of arterial stiffness as a biomarker of cardiovascular disease mortality in all age groups, this further supports the role of nitrates in heart health. However, a subgroup analysis of whether this benefit to arterial stiffness applied to all subjects found that only the subjects who were on medication experienced the decrease in PWV. Finally, similar to how two weeks cessation caused the elevations of plasma NOX and cGMP to return to normal levels, when nitrate was no longer used by hypertensive participants their blood pressure and blood flow returned to baseline levels. This indicates that nitrates are not curative, but rather a ‘band-aid’ supplement that exerts its benefits for only as long as it is used. Nitrate ingestion did not appear to be associated with any significant side-effects clinically, biochemically, or hematologically. Urine and feces were reported to change color in all groups due to the red coloration of the beet juice, which was an expected outcome. The pigments of beets, known as betalains, are eliminated in both urine and feces in a form which is still colored red, and leads to many people thinking their juice caused acute kidney or rectal trauma. There were no adverse interactions reported in the subjects using medication in regard to drug-drug interactions, suggesting a role for dietary nitrates as an adjuvant therapy (something to be taken alongside the ‘main course’ pharmacotherapy; adjuvants are the side-dishes of medicine). While the four subjects that dropped out were all subjects using medication, it was not determined to be relevant to the study, since they dropped out prior to receiving their placebo or nitrate supplementation and were split evenly between groups. People supplementing with nitrates experienced a reduction in blood pressure for up to two weeks after supplementation had ceased. While this study didn’t identify new benefits of nitrate, it’s quite important in the context of real-life recommendations physicians give to hypertensive patients. This study showed that previous evidence regarding nitrate’s acute benefits also extend to a sustained usage over four weeks. The study also eases a few concerns about potential drug-drug interactions, as nobody wants to introduce a new agent to a blood pressure-lowering regimen if it increases the risk of hypertension. This study also provides more evidence specifically addressing ambulatory blood pressure, which only a few studies on nitrates have done previously. Nitrate ingestion, even once a day, provides a sustained decrease in blood pressure for 24 hours, which can be extended by simply taking another dose each day. This can translate to substantial benefits for cardiovascular disease, as summarized in Figure 3. Even a 2 mmHg reduction in systolic blood pressure can reduce heart disease and stroke by 5% or more. Nitrate seems to be eliminated from the body somewhat rapidly (within two weeks) without leaving any apparent withdrawal effects or refractory increases in blood pressure. Nitrate is also a very feasible dietary option for a variety of populations, since it is found in some of the cheapest vegetables out there. Granted, a single salad may not be enough to replicate the benefits seen in this study, but thanks to the ability of a single dose of nitrate to stay in the body for at least 24 hours, every single meal with added greens provides health benefits. Nitrates are increasingly seen as an important component when it comes to determining vegetable health benefits. Food companies and the popular press often focus on the presence of vitamins, minerals, and phytochemicals in vegetables. While these no doubt play a role in improving health, it is possible that the tiny nitric oxide molecule explains a good portion of the health-giving properties of some vegetables. And this is all besides the potential beneficial effects of nitrates on exercise! Can I eat a bunch of preserved bacon and ham to get the same benefits? Nitrates were first used as food additives in the form of ‘sodium nitrite’ and ‘sodium nitrate,’ which are used as preserving agents in various processed meat products like bacon and ham. Sodium nitrite is responsible for the pink coloration of these products. As with many food additives, there are government regulations limiting what is considered a ‘safe’ amount that can be added to any food, with American regulations setting a limit of 10 parts per million (ppm) if nitrates are being used solely for coloration, and 200ppm if they are being used as a preservative, with no more than 500ppm allowed in the final cured meat product. The middle amount, most common for food products, translates to 200 micrograms per gram of food product, whereas the 6.4mM used in this study translates to 396mg. Due to this, food products that have added sodium nitrate are not able to provide a blood pressure reducing effect while remaining under the legal limitations for nitrate content. These regulations do not apply to food products, which naturally have a high nitrate content, notably leafy green vegetables and beets. I heard that there’s a link between nitrite/nitrate and cancer … should I worry? Nitrites are suggested to be involved in cancer metabolism, due to the interaction between nitrite and dietary amino acids, which can form various products known as nitrosamines. While not all nitrosamines are harmful, some have been determined to have carcinogenic activity. For a while, sodium nitrite and the resultant nitrosamines were thought to play a role in differences in cancer rates associated with processed meat consumption. When consuming nitrate or nitrite (regardless of source), most evidence points to needing a cocarcinogen to exert carcinogenic effects. Reducing compounds like vitamin C, abundant in plant-based sources of nitrate, further attenuate production of nitrosamines. Overall, the benefits of nitrates seem to have been underappreciated, while the risks have been possibly overemphasized. Does the effect of nitrate differ depending on which bacteria live in my mouth? There are up to 14 known bacteria which can metabolize nitrate into nitrite in the mouth, and these are known to vary significantly from one person to the next. The overall nitrite-producing capacities of bacteria also seem to differ between bacterial samples obtained from study participants. Differences in bacterial activity are proven to affect how much blood pressure is reduced, as there is less of an effect when bacteria is destroyed via mouthwash. But while differences in bacteria types can plausibly influence the magnitude of blood pressure reduction, this has not yet been directly investigated. Oral ingestion of nitrates in hypertensive patients, via beet root juice, leads to a reduction in blood pressure that can be sustained over the span of 24 hours. Blood pressure reduction increased in magnitude for up to four weeks of sustained supplementation. These effects occurred regardless of whether study participants were on hypertension medication.